We prepared this guide after seeing so many people struggle with understanding the design and construction process. This process can seem like a complex and frightening roadblock for those who haven’t been through it before. The most important step is preparation for design and choosing an architect. Nothing is more exciting than creating a new project for your home, and nothing will affect the success of your project more than the right preparation. The architect determines the design and function of a space or building as well as the emotional toll and financial costs involved in its construction, but the unique project requirements only you can determine. You may be wondering: what to consider? In this guide, you will discover how to prepare for your design, for your budget. 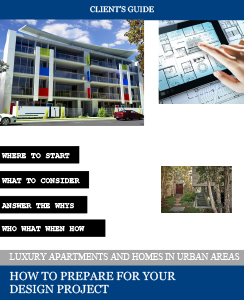 In addition to this issue you may also look for our guide How to Hire an Architect. FM Architecture turns your ideas and aspirations into imaginative, perfect workable solutions – and it’s what we love to do. When you contact us, we will run through a “needs analysis” with you on the phone to establish the approximate size of the project to make sure we can help you. To explore whether we might be right for each other, click the contact button below to tell us a little about yourself and your project.